Your Money or Your Lifestyle: What Do Millennials Consultants Care About? According to a recent survey by Fidelity Investments, almost 60% of millennials value work-life balance more highly than compensation in their careers. In a video piece discussing the survey's results, MarketWatch Reporter Catey Hill notes that, when it comes to assessing our levels of happiness at work, compensation typically isn't anywhere near the top of the list—it typically comes in around third or fourth. As one of those organizations that conducts regular research on leading companies, that's something that we've found to be true across the board: in the consulting industry, which is my main area of focus, both the firm's culture and colleagues, and the type of work outweigh compensation as considerations for most consultants, regardless of age or experience level. But the segment made me wonder: do millennial consultants really value compensation more highly than work-life balance? And, if so, how different are their attitudes from their older colleagues? My first step was to check out some of the data from our recent survey—where one of the questions we ask is about factors that are most important when choosing an employer. While we don't ask respondents for their ages, we do ask for experience levels. While it's not a perfect measure, if the average age of a first-year MBA student is 27, we can be reasonably certain that most respondents with up to 9 years of experience would qualify as "millennials." And, while we ask about a number of different factors, for the purposes of this post, I only compared the percentages of each cohort that selected compensation and/or work-life balance as key factors when choosing an employer—with the results indicating the relative importance of each factor to that cohort. 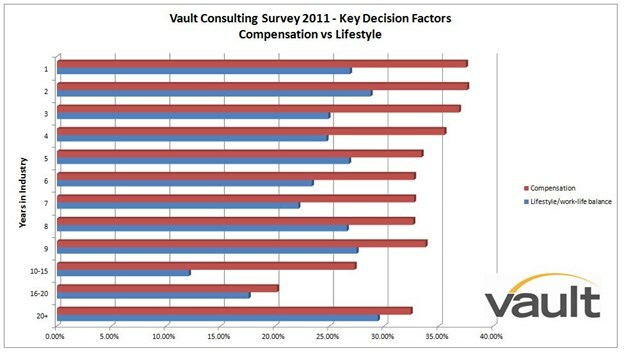 As you can see, there is no cohort where lifestyle/work-life balance outweighs compensation as a concern. The two factors are almost equal among 1st year consultants, but the relative importance of lifestyle as a factor tails off markedly with longer tenure, before spiking again after about 7 years—or approximately the point where a now 30-something, seasoned consultant might start caring more about balance for family reasons. First, note that, while first-year consultants were significantly more likely to care about compensation than work-life balance in 2011, the levels of concern over work-life balance have actually remained pretty consistent. The big difference isn't that consultants care more about work-life balance than they did 5 years ago—it's that they care less about compensation now than they did then. How much significance you choose to read into that is up to you, but here's something to keep in mind: the economic climate in 2011 was significantly gloomier than it is today. Unemployment was significantly higher, and both hiring and wage growth were slower. In other words, it was an employer's market, and there was a significant degree of concern about what would happen if you couldn't break into it. As such, that may explain both the higher degree of concern about compensation among members of the post-2008 cohort (years 1-3 in 2011) than in the corresponding cohort in the 2016 survey. Second, consider that, in all likelihood, the people with 1-5 years of experience in 2011 were likely also millennials. By the time that cohort shows up again on our survey in 2016—now with 6-10 years of experience—they're generally more likely to value compensation higher than work-life balance than their younger colleagues. 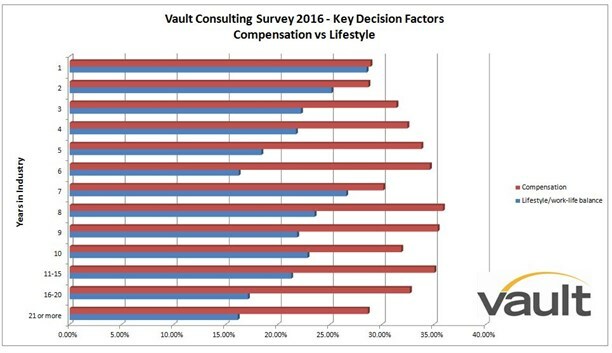 Interestingly, this was not the case when that group entered the consulting industry—they were significantly more likely than their elders to list compensation as a key factor. 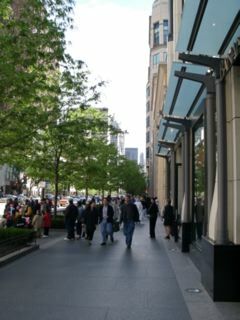 So if the Great Recession did play a role in shaping those priorities initially, its effects seem to have lingered among the cohort that graduated into it, while the fears have dissipated among those hitting the market with more control over their future. So what, if anything, does this tell us about millennials as a group? Here's my take: nothing at all. Or, to put it another way: it tells us that treating the group as a homogeneous entity is counterproductive—the results of these surveys are far more likely to reflect external market conditions than they are to uncover universal truths about the psyche of a disparate group of people who just happen to have been born within a handful of years of one another.